Two city dwellers build their dream home in Lower Village. City dwellers are an adaptable bunch. Fueled by the hustle and bustle, they aren’t deterred by a little background noise, and somewhere along the way have made peace with the fact that their personal space is, well, shared. 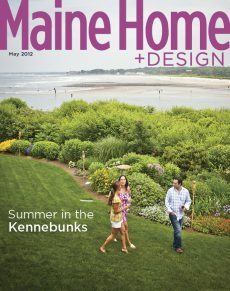 And while most of Maine offers quite a different experience, there are places here where city lovers feel more at home. Take Robin and Kelly Kavanagh, for example. “We’re city people,” they say emphatically during a conversation at their Kennebunk home. After living in Boston for more than 20 years, the couple traded in their single-family South End home, put their furniture in storage, and moved into a 1,000-square-foot contemporary condo downtown—all so they could save up to build their future home in Maine. In Boston they love being able to walk everywhere, having access to countless great restaurants and art galleries, being in the thick of it all. Although Kennebunk is a far cry from a big city, when the Kavanaghs decided to build in Maine, Lower Village was a natural fit—an in-town location, within walking distance to everything they needed. They would be at home here. Kelly and Robin have been together for 28 years, but long before they met, the two spent their childhood summers in Maine—she at Wells Beach and he in the Sebago Lake region. Since they’ve been together, they have made annual trips to Goose Rocks Beach, where Kelly’s sister and her family have summered for decades. Somewhere along the way they began dreaming about having their own home in the Kennebunks. Luckily, the search for the right builder was easier. The couple gravitated toward the homes built by Kevin Lord of Thomas and Lord in Kennebunkport, so they tracked him down. “It wasn’t long before he called to tell us he had the perfect spot,” recalls Robin. “We’d be able to walk to Dock Square and the beach, still have a nice-sized yard, be close to family on Goose Rocks, and have a custom home.” Intrigued, the two were introduced by Lord to Tim Harrington, the developer behind the Cottages at Morning Walk, which Lord was building in collaboration with designer Erik Peterson, of Peterson Design Group, and landscape designer Ted Carter of Ted Carter Inspired Landscapes. When they first saw the property, it was pouring rain. Huddled underneath a golf umbrella, Kelly and Robin were a little skeptical at first. “You promise me this is the sunniest lot?” Kelly asked. Harrington said, “Trust me.” So they did. With everything. With the goal of living full-time in the house after retirement, the Kavanaghs’ list of must-haves included an open-concept approach to the kitchen, living room, dining room, and sunroom; enough bedrooms and attached baths to accommodate guests; and a seamless indoor-to-outdoor flow. As a result, virtually every room provides access to the outside, and all of the exterior doors lead to a common backyard. “We love being able to open the doors—day or evening—and have it all illuminated. We wanted a home where our outside spaces would be extensions of our living space,” says Kelly. Until the Kavanaghs reach retirement age, their time in Kennebunk will always end with a trip back to Boston, back to work, back to everyday life. But someday, this house they so carefully built and designed will be their permanent home. With all the charms of Kennebunk right outside their door.